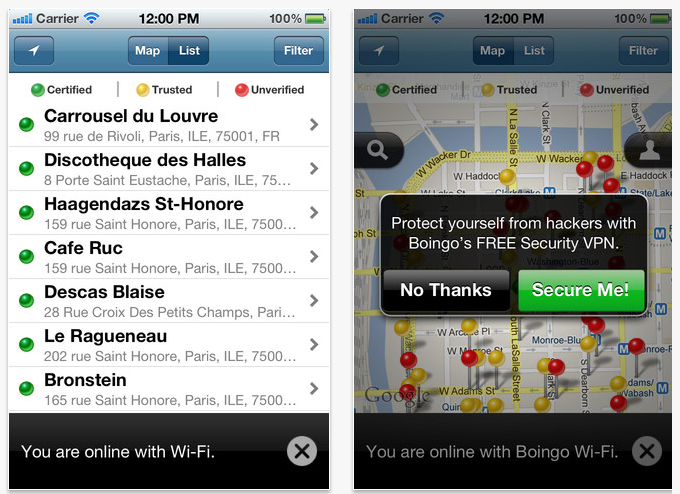 Boingo’s free Wi-Finder software for iOS is gaining two useful new tricks. First of all, it adds technology that can help users when logging in to unprotected hotspots. Traditionally, so-called virtual private networking (VPN) software was used to log in to a corporate firewall. But VPNs also serve another important purpose — they help secure the data that is being sent. Secondly, Boingo is adding data on a whole bunch of new hotspots — some 70,000 — that its users have sniffed out during the past year. The software adds only those networks that people have been successful at connecting to. Indeed, Boingo has learned a lot since introducing the software a year ago. For instance, it now knows some of the most popular Wi-Fi network names. In addition to AT&T’s vast network, among the most popular networks are Denver’s airport, Hilton hotels and United’s airport clubs, as well as the default names of popular router vendors like Netgear and D-Link. Good old “Internet” is also in the Top 10. As for countries where Boingo users found the most free hotspots, the U.S. was, naturally, first, followed by the U.K., Canada, Brazil, France, Spain, Germany, Italy and South Korea. In the U.S., the most crowdsourced free hotspots were found in Miami, Atlanta, New York and Los Angeles. San Francisco did not make the Top 10. As for who contributed the most data, Boingo isn’t naming names, for privacy reasons. But it did say the top contributor connected to 69 different networks in a 100-day period, generating more than 2,000 connections.